This short-title list of works in the collection of Jay Pasachoff is arranged in chronological order by year of publication, and alphabetically by author’s surname within a given year. All of the volumes are on deposit in the Chapin Library at Williams College. Jakob Pflaum, ca. 1450–1500. Calendarium. Ulm: Johannes Zainer, 1478. Alfonso X, “el Sabio,” King of Castile and Leon, 1221–1284. Tabulae Astronomicae. Venice: Erhard Ratdolt, 1483. Hartmann Schedel, 1440–1514. Liber Chronicarum. Nuremberg: Anton Koberger, 1493. Folio 167 (only) of the Nuremberg Chronicle. Claudius Ptolemy, 2nd Century. Almagestum. Venice: Petrus Liechtenstein, 10 January 1515. Bound with: Georg Peurbach, 1423–1461, Tabulae Eclypsium, and Johannes Regiomontanus, 1436–1476, Tabula Primi Mobilis, Vienna: Johannes Winterburger, 1514. Alessandro Piccolomini, 1508–1578. De le sfera del mondo . . . [with] De le stelle fisse. Venice: Al Segno del Pozzo, 1540. Nicolaus Copernicus, 1473–1543. De Lateribus et Angulis Triangulorum. Wittenberg: Johannes Lufft, 1542. Nicolaus Copernicus, 1473–1543. De Revolutionibus Orbium Coelestium. Nuremberg: Johannes Petreius, 1543. Leonard Digges, ca. 1520–1559? A Prognostication Everlasting of Ryght Good Effecte. The seconde impression augmented by the author. London: Thomas Gemini, 1556. Cyprian Leowitz, 1524–1574. De Conjunctionibus Magnis Insignioribus Superiorum Planetarum. Lauingen: Emanuel Salczer, 1563. Christoph Clavius, 1538–1612. In Sphaeram Ioannas de Sacro Bosco Commentarius. Venice: Bernardum Basam, 1596. Leonard Digges, ca. 1520–1559? A Prognostication Euerlasting of Right Good Effect. Lately corrected and augmented by Thomas Digges his sonne. London: Imprinted by the Widow Orwin, 1596. Johannes Kepler, 1571–1630. Prodromus Dissertationum Cosmographicarum, continens Mysterium Cosmographicum. Tübingen: Georg Gruppenbach, 1596. Issued with Georg Joachim Rheticus, 1514–1576, De Libris Revolutionum . . . Nicolai Copernici, with an appendix by Michael Maestlin, 1550–1631. Tycho Brahe, 1546–1601. Astronomiae Instauratae Progymnasmata. Prague: Heirs of Tycho Brahe, 1602. Johannes Bayer, 1572–1625. Uranometria. Augsburg: Christopher Mangus, 1603. Johannes Kepler, 1571–1630. Ad Vitellionem Paralipomena, Quibus Astronomiae Pars Optica Traditur. . . . Frankfurt: Claudius Marnius & Heirs of Joannis Aubrius, 1604. Johannes Kepler, 1571–1630. De Stella Nova. Prague: Paulus Sessius, 1606 (parts 1–2); Frankfurt, 1606 (part 3); Frankfurt: Wolfgang Richter, 1606 (part 4). Johannes Kepler, 1571–1630. Astronomia Nova. Heidelberg: Gotthard Vögelin, 1609. Tycho Brahe, 1546–1601. Astronomiae Instauratae Progymnasmata. Frankfurt am Main: Gottfried Tambach, 1610. Galileo Galilei, 1564–1642. Sidereus Nuncius. Venice: Tommaso Baglioni, 1610. Bound with: Francesco Sizi, Dianoia Astronomica, Optica, Physica, qua Syderei Nuncij Rumor de Quatuor Planetis à Galilaeo Galilaeo, Venice: Pietro Maria Bertano, 1611; Marco Antonio de Dominis, 1560–1624, De Radiis Visus et Lucis in Vitris Perspectivis et Iride, Venice: Tommaso Baglioni, 1611; and Giovanni Antonio Magini, 1555–1617, Breve instruttione sopra l’apparenze et mirabili effetti dello specchio concavo sferico, Bologna: Giovanni Battista Bellagamba, 1611. Galileo Galilei, 1564–1642. Istoria e dimostrazioni intorno alle macchie solari e loro accidenti. Rome: Giacomo Mascardi, 1613. Simon Marius, 1573–1624. Mundus Iovialis Anno M DC IX Detectus Ope Perspicill Belgici. Nuremberg: Johann Laur, 1614. Johannes Kepler, 1571–1630. Harmonices Mundi. Linz: Johann Planck for Gottfried Tambach, 1619. Galileo Galilei, 1564–1642. Il Saggiatore. Rome: Giacomo Mascardi, 1623. Johannes Kepler, 1571–1630. Tabulae Rudolphinae. Ulm: Jonas Saur, 1627. Galileo Galilei, 1564–1642. Dialogo. Florence: Giovanni Batista Landini, 1632. Johannes Hevelius, 1611–1687. Selenographia. Gdańsk: Published by the author, printed by Andreas Hünefeld, 1647. Johannes Hevelius, 1611–1687. Mercurius in Sole. Gdańsk: Published by the author, printed by Simon Reiniger, 1662. Galileo Galilei, 1564–1642. Systema Cosmicum. London: Thomas Dicas, 1663. Isaac Newton, 1642–1727. Philosophiae Naturalis Principia Mathematica. London: Joseph Streater for Sam. Smith, 1687. Johannes Hevelius, 1611–1687. Firmamentum Sobiescianum sive Uranographia. Gdańsk: Johann Zacharias Stolle, 1687 [i.e., 1690]. Edmond Halley, 1656?–1742. 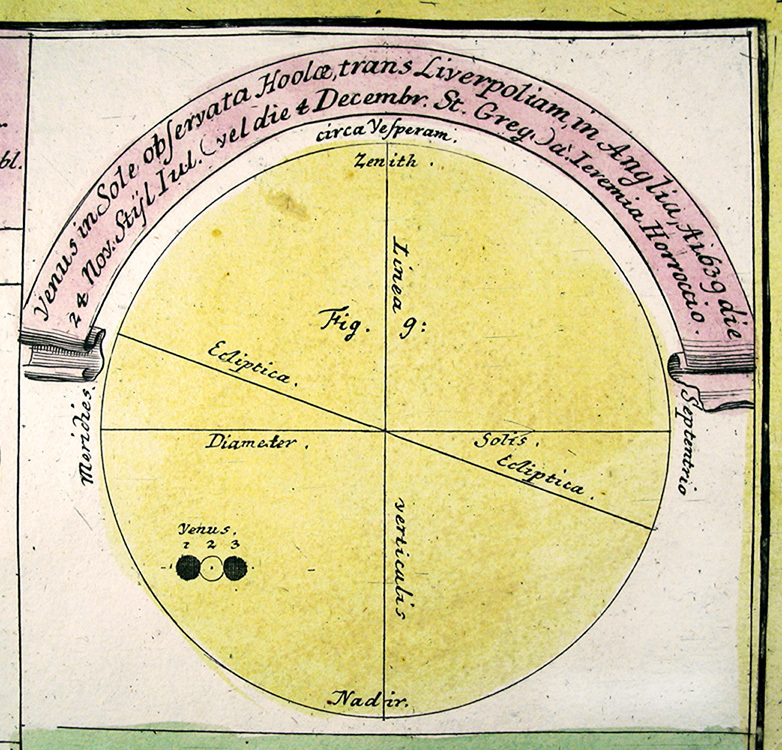 A Description of the Passage of the Shadow of the Moon over England, in the Total Eclipse of the Sun, on the 22d. Day of April 1715 in the Morning. London: I. Senex, 1715. Edmond Halley, 1656?–1742, et al. Miscellanea Curiosa. 3 v.: v. 1, third edition, London: Printed by W.B. for James and John Knapton, and John Clarke, 1726; v. 2, London: Printed for James Knapton and John Clarke, 1723; v. 3, second edition, London: Printed for James and John Knapton, and John Clarke, 1727. Isaac Newton, 1642–1727. The Chronology of Ancient Kingdoms Amended. London: Printed for J. Tonson, and J. Osborn and T. Longman, 1728. Isaac Newton, 1642–1727. A Treatise of the System of the World. London: Printed for F. Fayram, 1728. Johann Gabriel Doppelmayr, 1671–1750. Atlas Coelestis. Nuremberg: Homann Heirs, 1742. David Gans, 1541–1613. Nehmad ve-Na’im. Jessnitz: Israel bar Abraham, 1743. Edmond Halley, 1656?–1742. Tabulae Astronomicae. London: William Innys, 1749. John Flamsteed, 1646–1719. Atlas céleste. Seconde édition, par M.J. Fortin. Paris: F.G. Deschamps and the author, 1776. Philosophical Transactions, of the Royal Society of London, Vol. LXXI. For the Year 1781. Parts I– II. London: Sold by Lockyer Davis and Peter Elmsly, 1781–1782. Includes “Account of a Comet” by William Herschel, 1738–1822. Alexandre Guy Pingré, 1711–1796. Cométographie ou Traité historique et théorique des comètes. Paris: Imprimerie Royale, 1783–84. 2 v.
John Bevis, 1695–1771. Uranographia Britannica (or Atlas Celeste). Printed 1747–9, published 1786. John Flamsteed, 1646–1719. Atlas céleste. Third edition. Paris: Lamarche et al., 1795. Caroline Herschel, 1750–1848. Catalogue of Stars, Taken from Mr. Flamsteed’s Observations Contained in the Second Volume of the Historia Coelestis and Not Inserted in the British Catalogue. London: Sold by Peter Elmsly, 1798. Joannis Elerti Bode, 1747–1826. Uranographia. Berlin: Published by the author, 1801. Joseph von Fraunhofer, 1787–1826. Bestimmung des Brechungs- und Farbenzerstreuungs-Vermögens verschiedener Glasarten. Munich: Lentner, 1817. H.C. Schumacher, 1780–1850. Astronomische Abhandlungen. Altona: Gebruckt in der Hammerich- und Heineking’schen Buchdruckerey, 1823–5. 3 v. in 1. P.A. Secchi, 1818–1878. Die Sonne. Braunschweig: Druck und Verlag von George Westermann, 1872. J. Norman Lockyer, 1836–1920. Contributions to Solar Physics. London: Macmillan, 1874. J. Norman Lockyer, 1836–1920. Studies in Spectrum Analysis. New York: D. Appleton, 1878. Annalen der Physik, 4th series, Band 17. Leipzig: Johann Ambrosius Barth, 1905. Contains three papers by Albert Einstein, 1879–1915, “Über einen die Erzeugung und Verwandlung des Lichtes betreffenden heuristischen Gesichtspunkt” (“On a Heuristic View Concerning the Production and Transformation of Light”), “Über die von der molekularkinetischen Theorie der Wärme geforderte Bewegung von in ruhenden Flüssigkeiten suspendierten Teilchen” (“On the Motion of Small Particles Suspended in a Stationary Liquid According to the Molecular Kinetic Theory of Heat”), and “Zur Elektrodynamik bewegter Körper” (“On the Electrodynamics of Moving Bodies”). Albert Einstein, 1879–1915. Die Grundlage der allgemeinen Relativitätstheorie. Leipzig: Johann Ambrosius Barth, 1916. Richard P. Feynman, 1918–1988. QED: The Strange Theory of Light and Matter. Princeton, N.J.: Princeton University Press, 1985. With a Feynman diagram and signature of Prof. Feynman on the title-page provided to Prof. Pasachoff. Bible. Mainz: Johann Gutenberg, ca. 1455. One leaf, part of 2 Chronicles from 3:8 to 6:3, which describes the building of the Temple of Solomon. With separate book: A Noble Fragment, Being a Leaf of the Gutenberg Bible, with a bibliographical essay by A. Edward Newton, New York: Gabriel Wells, 1921. Twenty-five astronomical plates of the late 18th to early 19th century, engraved by Lizars, Kirkwood, Moffat, and Ixars. The first seventeen are from an unknown late edition of James Ferguson’s Astronomy Explained upon Sir Isaac Newton’s Principles (first published London, 1756). Wayne G. Hammond is the Chapin Librarian at Williams College.